This company has launched an inventory-management solution (photo) for mining and aggregates companies to reconcile drone surveys with data from enterprise resource planning (ERP) and other systems of record for production and sales data. Bringing together drone-based topographic surveys, cloud-based analytics and inventory-management capabilities provides a single source of data to streamline operations. Included are capabilities to track specific products across multiple production sites, enabling users to more efficiently plan production and logistics for high-demand materials by identifying discrepancies in inventory data faster to avoid costly issues, such as overproduction. Teams in multiple locations can benefit from visibility into site-wide materials, enabling transparency across operations, sales, surveyors, engineers and management. 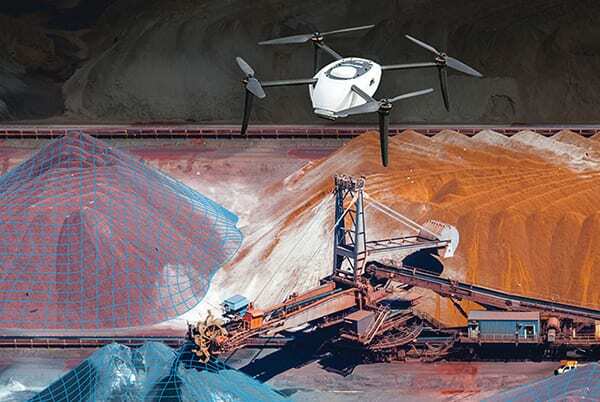 Autonomous, on-demand drone flights over stockpiles reduce reliance on third-party or manual measurement and can provide volume calculations within 1–3% of true volume, says the company. Furthermore, drones can help to visualize the calculated base plane in three dimensions to ensure volumetric quality assurance and verify elevation changes and measure linear distances all from a single workspace. – Kespry, Menlo Park, Calif.